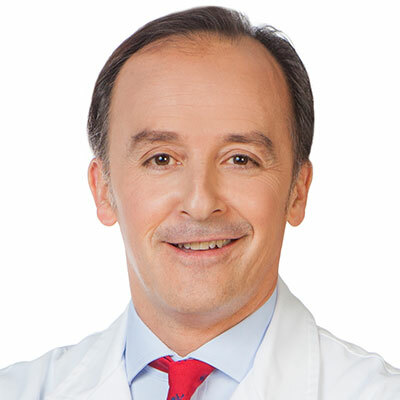 Home/Investigators and Research Centers/Investigators/Juan García Velasco, M.D., Ph.D.
Juan García-Velasco, MD, PhD, is Director of IVI Madrid, where he attends his patients. He is also Professor of Obstetrics and Gynaecology at Rey Juan Carlos University, Madrid, Spain, where he is Director of their Master’s Degree Programme in Human Reproduction. 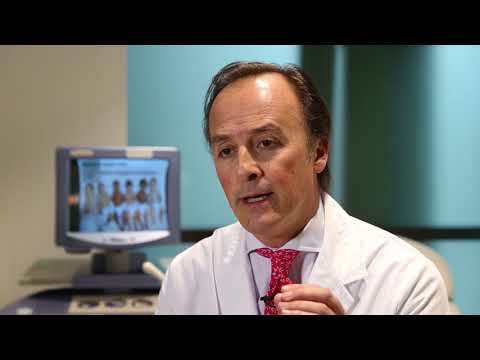 Professor García-Velasco graduated from University Medical School, Madrid, in 1990 and received his obstetrics and gynaecology certification from La Paz Hospital, Madrid, in 1995. He completed his PhD in Medicine at Autonoma University, Madrid, in 1995, and from 1997 to 1998 studied at Yale University, New Haven, CT, under a Reproductive Endocrinology and Infertility Fellowship. Professor García-Velasco’s main research interests have been in IVF and endometriosis. He is the Principal Investigator of projects funded by the Ministry of Education and Ministry of Health in Spain, and has received awards from the Spanish Fertility Society, Spanish Society of Obstetrics and Gynaecology, and the European Society of Human Reproduction and Embryology. He has published over 190 peer-reviewed articles and 22 book chapters on human reproduction, endometriosis and hypo- and hyper-ovarian stimulation response. He is the Co-Editor of Reproductive Biomedicine Online. 191 peer reviewed articles, 22 book chapters and 4 edited books. Ovarian endometriosis and infertility: in vitro fertilization (IVF) or surgery as the first approach? Comparative economic study of the use of corifollitropin alfa and daily rFSH for controlled ovarian stimulation in older patients: Cost-minimization analysis based on the PURSUE study. Reprod Biomed Soc Online, 5:46-59, 2018. How new technical knowledge impacts clinical approach to infertile patients. Curr Opin Obstet Gynecol, 30(3):137-138, 2018. Individualized versus conventional ovarian stimulation for in vitro fertilization: a multicenter, randomized, controlled, assessor-blinded, phase 3 noninferiority trial. Nyboe Andersen A, Nelson SM Fauser BC García-Velasco JA Klein BM Arce JC ESTHER-1 study group. Fertil Steril, 107 (2): 387-396.e4, 2017. Assisted reproductive techniques after fertility-sparing treatments in gynecological cancers. A cost-effectiveness evaluation comparing originator follitropin alfa to the biosimilar for the treatment of infertility. Int J Womens Health. 8:683-689, 2016. ESTHER-1 study group. Fertil Steril. 107:387-396, 2017. Ethnicity is an independent predictor of IVF-ICSI outcome: a study of 5,549 cycles in Spain and India. Reprod Biomed Online. 31:717, 2015. Treatment of infertility associated with deep endometriosis: definition of therapeutic balances. Revisiting ovarian hyper stimulation syndrome: Towards OHSS free clinic. J Hum Reprod Sci. 8:13-7, 2015. A multi-centre phase 3 study comparing efficacy and safety of Bemfola(®) versus Gonal-f(®) in women undergoing ovarian stimulation for IVF. Reprod Biomed Online. 30:504-13, 2015. GnRH-agonist triggering to avoid ovarian hyperstimulation syndrome: a review of the evidence. Patients from across Europe have similar views on patient-centred care: an international multilingual qualitative study in infertility care. Understanding the perceptions of and emotional barriers to infertility treatment: a survey in four European countries. Empty follicle syndrome after GnRHa triggering versus hCG triggering in COS.
J Assist Reprod Genet. 29:249-53, 2012. Human follicular fluid from superovulated women inhibits progesterone receptor-dependent gonadotropin-releasing hormone self-priming in an estrous cycle-dependent manner in the rat. J Endocrinol Invest. 33:564-70, 2010. Comprehensive proteomic analysis of human endometrial fluid aspirate. J Proteome Res. 8:4622-32, 2009. Circulating estradiol defines the tumor phenotype in menopausal breast cancer patients. How to avoid ovarian hyperstimulation syndrome: a new indication for dopamine agonists. Reprod Biomed Online. 18 Suppl 2:71-5, 2009. Endometrial fluid is a specific and non-invasive biological sample for protein biomarker identification in endometriosis. Management of endometriomas in women requiring IVF: to touch or not to touch. Aromatase inhibitors in ovarian stimulation. Reprod Biomed Online. 13:906, 2006. Effect of repeated assisted reproduction techniques on the ovarian response. Curr Opin Obstet Gynecol. 17:233-6, 2005. Apoptosis and the pathogenesis of endometriosis. Semin Reprod Med. 21:165-72, 2003. Early maternal hypothyroxinemia alters histogenesis and cerebral cortex cytoarchitecture of the progeny. J Clin Invest. 111:1073-82, 2003. Elevated soluble Fas ligand levels may suggest a role for apoptosis in women with endometriosis. Regulation of fas ligand expression by IL-8 in human endometrium. Estradiol down-regulates MCP-1 expression in human coronary artery endothelial cells. Extracellular matrix-dependent regulation of Fas ligand expression in human endometrial stromal cells. Role of thyroid hormones in the maturation and organisation of rat barrel cortex. Empty follicle syndrome: evidence for recurrence. Regulation of monocyte chemotactic protein-1 expression in human endometrial cells by integrin-dependent cell adhesion. Is the endometrium or oocyte/embryo affected in endometriosis? Hum Reprod. 14 Suppl 2:77-89, 1999. Unicornuate uterus with a rudimentary horn and ovarian dysgerminoma. A case report. J Reprod Med. 44:1025-8, 1999. Interleukin-8 expression in endometrial stromal cells is regulated by integrin-dependent cell adhesion. Mol Hum Reprod. 5:1135-40, 1999. Interleukin-8 stimulates the adhesion of endometrial stromal cells to fibronectin. Regulation of monocyte chemotactic protein-1 expression in human endometrial stromal cells by integrin-dependent cell adhesion. Biol Reprod. 61 :548-52, 1999. Macrophage derived growth factors modulate Fas ligand expression in cultured endometrial stromal cells: a role in endometriosis. Mol Hum Reprod. 5:642-50, 1999. Increasing the length of the middle crura for better tip projection in primary rhinoplasty. Aesthetic Plast Surg. 22:253-8, 1998. Rupture of an ovarian endometrioma during the first trimester of pregnancy. Eur J Obstet Gynecol Reprod Biol. 76:41-3, 1998.